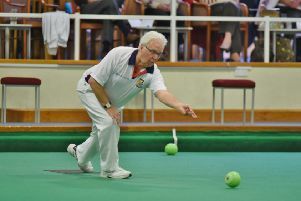 Northants Bowling Federation president Bob Warters lifted the veteran singles title at Skegness. Northants Bowling Federation president Bob Warters, a journalist by profession, could not have written a better script for his presidential year. Not only did the county enjoy a record-breaking championships at Skegness, with one team title, two individual winners, three other finalists, and, for good measure, winning the Victor Ludorum awarded to the most successful men’s county in finals week, he also returned home as the veterans singles champion. The Ketton player was also part of the successful county team that won the Adams Trophy county championship for the first time, so winning the veterans singles 21-12 against Steve Botten (North Essex) on the final morning put the icing well and truly on the cake. At the same time, Whittlesey Manor’s Roger Stevens and Tony Mace were completing an age-group double for the county by winning the senior pairs final 17-10 against North Essex, but the men’s pairs and both rinks had to be content with silver medals the previous afternoon. “It was a fairytale finish to the season and our best performance since the Victor Ludorum was introduced in 1979,” said Warters. Yaxley’s Robert Heath and Tony Belson ran out comfortable 18-12 semi-final winners over North Essex, but shortly afterwards were overwhelmed 23-7 by Notts in a final brought forward to enable Heath to be at his daughter’s wedding on Saturday. In the two-bowl rinks, the Parkway trio of Stuart Reynolds, James Harford and Mike Robertson were beaten 19-12 by Suffolk in the final, while on an adjoining rink the Blackstones team of Adam Warrington, Martyn Dolby and Jonathan Earl went down 20-15 to a Hunts trio skipped by city-based Nicky Brett in the three-bowl event. All told the county had seven finalists in the individual portion of the championships, but unfortunately the two in the women’s section, Sue Moir (Langtoft Pearl), in the four-bowl singles, and Parkway mother and daughter Val and Sarah Newson, in the pairs, finished on the losing side. Moir lost 21-13 to Humberside’s Janice Ellis, while the Newsons were unable to capture the form of previous rounds and were beaten 20-5 by Northumberland. Sarah Newson, who had qualified in four events, had the chance to make the final in the two-bowl singles, but was beaten 21-18 in the semi-finals. 2b singles – Gavin Jinks (Whittlesey Manor) lost 21-10 to Norfolk in first round. 4b singles – Joe Martin (Peterborough & District) lost 21-12 to Lincs in first round. U25 singles – Stephen Harris (Blackstones) lost 21-9 to Lincs in the second round after a 21012 win over Norfolk. Champion of Champions – Adam Warrington (Blackstones) lost 21-10 to Norfolk in the second round after a 21-14 win over Hunts. Secretaries singles – Melvyn Beck (Whittlesey Manor) lost 21-16 to Northumberland in the second round after receiving a walkover. Mixed pairs – Chris Morton & Simon Law (Parkway) lost 20-4 to North Cambs in the second round. Senior mixed pairs – Ann & Malcolm Cullingworth (Langtoft Pearl) lost 20-13 to Cleveland in the second round. U25 open pairs – Jack Corney (Peterborough & District) & Hannah Overton (Parkway) lost 25-9 to Derbys in the second round after a 25-9 win over Cleveland. Mixed triples – Shirley Suffling (Ketton), Nick Wilkie and Paul Buckley (both Blackstones) lost 23-20 to Durham in the second round after a 19-16 win over Lincs. U25 singles – Louise Harris (Blackstones) lost 21-17 to Hunts in second round. Senior singles – Fiona Richardson (City of Peterborough) lost 21-6 to Derbyshire after a 21-11 win over North Essex. Secretaries singles – Liz Ritchie (Empingham) lost 21-10 to Suffolk in the first round. Champion of Champions – Ann White (Langtoft Pearl) lost 21-9 to Humberside in the second round. Senior pairs – Viv Hempsell & Kathy Browning (Yaxley) lost 19-16 to North Cambs in the second round after a 18-13 win over Cleveland. 2b triples – Helen Crow, Sarah Newson, Pat Reynolds (Parkway) lost 16-15 to Humberside in the first round. 3b triples – Helen Crow, Sarah Newson, Pat Reynolds (Parkway) lost 15-14 to Humberside in the second round after a 22-11 win over Northumberland.